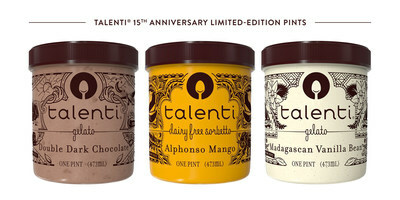 The Talenti Alphonso Mango Sorbetto pint artwork features regional motifs inspired by the lotus flowers from the Maharashtra region of India, where Talenti sources its Alphonso mangos. The Talenti Double Dark Chocolate Gelato pint artwork features chunks of rich dark chocolate sourced from Belgium which Talenti uses to create a decadent base and then blends with semi-sweet chocolate chips and a hint of vermouth. The Talenti Madagascan Vanilla Bean Gelato pint artwork features blooming orchids from the vanilla bean plant of Madagascar. Talenti slow cooks its vanilla beans in cream, sugar and milk – adding a dash of lemon to enhance the floral vanilla notes. In 2003, Talenti began as a small gelateria in Dallas. The founder, Josh Hochschuler, learned the art of gelato making while living in Argentina and working as an apprentice under a gelato maker. During this time, he learned the craft of making old-world style gelato ― the slow process of cooking batches of ingredients together to infuse maximum flavor. Hochschuler packaged his gelato in the clear pints that today have become synonymous with the Talenti brand and collected by many throughout the country.